Computer security is no jada, jada, jada. The Internet threats are not gone. Whenever you are using your computer and the Internet, you are taking part in a war, whether you want it or not. The days when viruses or malware were made just to show off technical superiority are history. Viruses and malware have become a serious business. So have the threats from them. Now they range from showing unwanted advertisement to stealing your credit card information to turning your computer into an accomplice in attacking web sites and spreading viruses further. 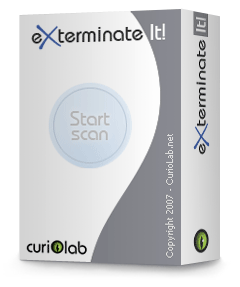 The first SAFETY LINE application that we produced is Exterminate It!. Exterminate It! bundles the malware detection capability with a virus scanner. Our constantly growing virus database covers about 94% of all known viruses and malware. Should you encounter an unknown virus, the SUBMIT STATE feature will let you communicate your virus issue to our experts and have it resolved with the next database update within 24 hours. We will make that update available to other users to safeguard their PCs against the viruses that attacked your computer. So by submitting your virus case information, you help other people maintain adequate computer protection. We provide an effective answer to modern virus and malware threats. By choosing Exterminate It!, you'll get the best ally to fight on your side in the information war. Live protection is useless for known security breaches. Once the operating system is updated to fix a vulnerability, the attacks have no effect, so there is no need to address them. Live protection is ineffective against the latest security breaches. If the operating system is vulnerable, it is easy for virus writers to come up with new ways of infecting it. Live protection will impact your productivity. Live protection takes a toll on all aspects of your computer performance: processor, memory, disk access, and network connection - everything is affected. For more information about Exterminate It!, visit the Exterminate It! web site at www.exterminate-it.com. Stay tuned for more CurioLab products coming up.